How can DirecTV possibly show a rating of “4.7 out of 5” w/ the preponderance of 1 Star ratings? Possibly because most of these extremely poor ratings are the most recent? 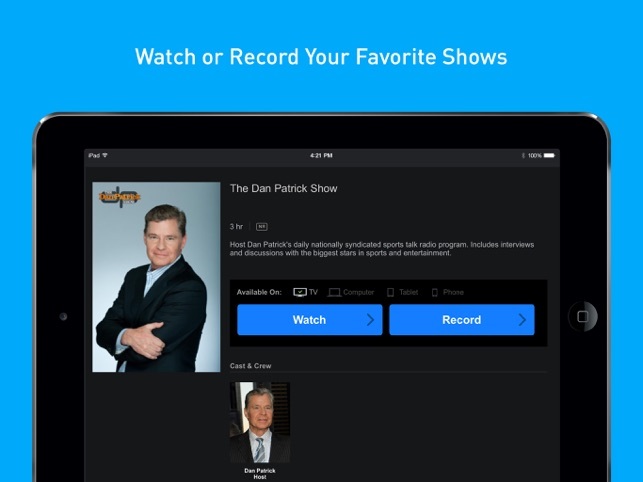 We previously had Dish TV and had a much better experience w/ their app for remote viewing on an iPad. Admittedly, there were other problems w/ Dish that caused us to migrate to DirectTV but we are now extremely disappointed in that decision. Our only choice may be to return to Cable TV though we dislike that as well. 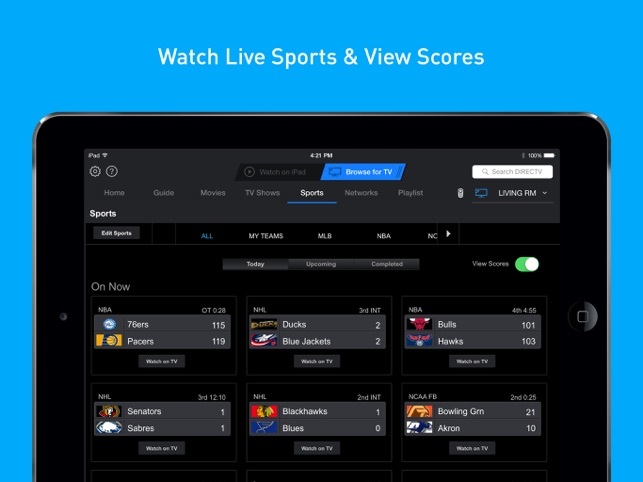 The DirecTV app has worked very intermittently for us while south for the month. 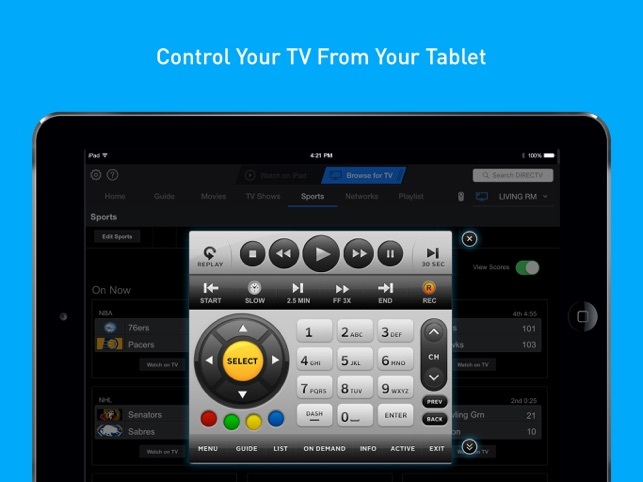 I finally got tired of asking our neighbor at home to go into our house and reset the DirecTV receiver which would enable the DirecTV app on our iPad to function for a couple days before we could again no longer remotely connect to the receiver. Here is a PARTIAL SOLUTION that I highly recommend: BEFORE leaving home, place the power cord for the DirecTV receiver into a plug-in lamp timer that will shut the power off briefly in the middle of the night. This causes the receiver to reboot once each night. That worked for a while but now again we can no longer connect at all. Tech support can only tell us that we must return home to re-establish the proper connection while both the receiver and our iPad are connected to the very same WiFi network. This app is not worth the trouble! 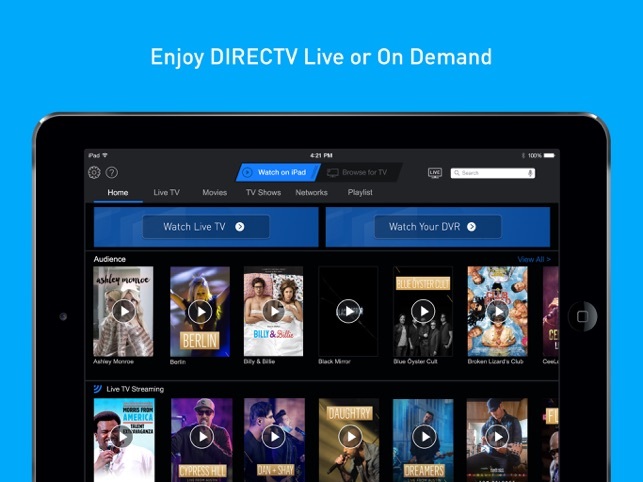 I bought an iPad specifically to use the deal Direct Tv advertised of streaming your TV anywhere. It used to work every now and then. But now most the channels don’t work. They either don’t show up on my channel list or I get an error message saying my receivers is in use although I was told I could have up to five devices on the app. Or I’m told this content is unavailable even if it’s not a sports thing that maybe would be blacked out. Every time I call DirecTV they have no idea what to tell me, but they read me the same lines saying “the channel lineup is being renegotiated and some channels may not be available while they’re being renegotiated.” Or they say “the channels you get streaming are not the same as the ones you get on your home Wi-Fi network.” But I know those things are lies because they told me the same since Christmas Day last year and yet sometimes it does work sometimes it doesn’t . No one at DirecTV customer service or tech-support knows how to help get this fixed. If I could take these two tablets back and get my money back for the months I’ve already paid for and have them off my account I would. But I really just wish it would work as they advertised it and as it sometimes works. As it is now this is a useless terrible app. And the people DirecTV do not know how to support it. Why is the volume limited on an iPad? Can't hear it!!! Is there anyone on your development team thinking this app's design is any good? It's not. Case in point, simply changing the channel while watching live TV on an iPad Pro: tap picture to bring up frame. Tap icon to reduce picture. 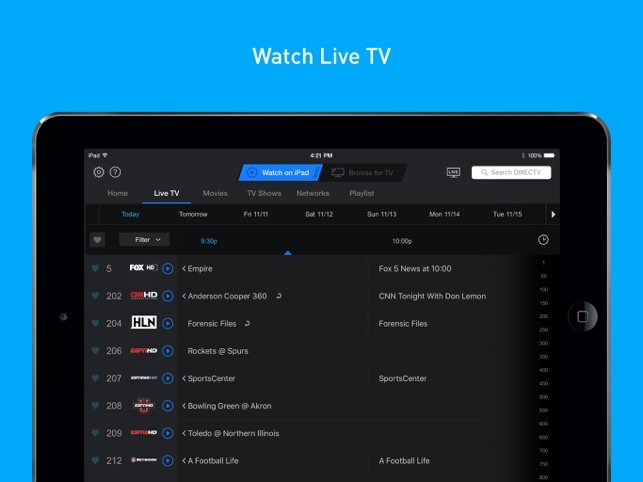 Tap and drag picture half out of sight to reveal channel list. Scroll painfully slowly to desired channel and tap. If it doesn't crash (50/50), go back to picture and drag box up so you can see entire frame. Tap the icon in lower right corner to have picture be full frame. That's how you change the channel. Seriously? You could try typing channel # in search box but that doesn't work. You could type in network name in search box and scroll through that list to find the actual network channel live. But I surf to see what's on, not to patronize by channel. And why is the volume maxed out so frickin' low?!? Terrible design, surely you know that? Optimum was sooo much better. Guess that's why Optimum costs more. Directv costs less up front because you get less. Buyer beware.